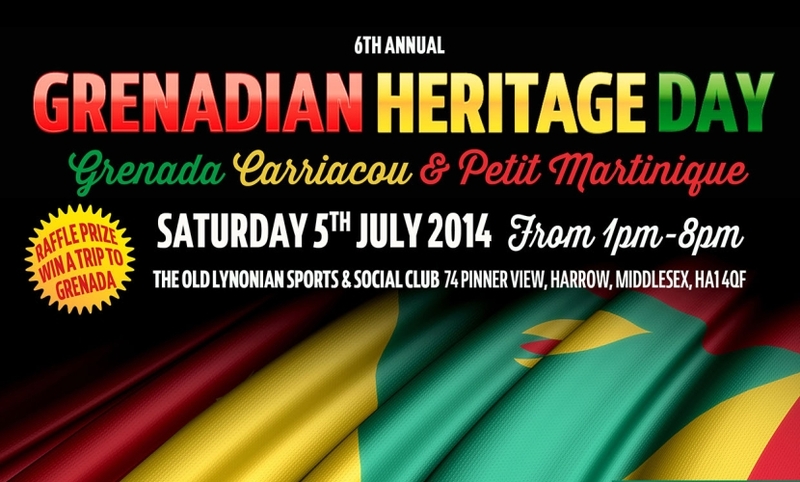 Grenadian community groups in Britain and the High Commission for Grenada, will be hosting the 6th Annual Grenadian Heritage Day on Saturday, 5th July 2014 at The Old Lyonian Sports and Social Club, 74 Pinner View, Harrow, Middlesex, HA1 4QF – see leaflet attached for further information. The Annual Grenadian Heritage Day is a family, community and charity event and will feature Grenadian cuisine, Grenadian products, arts and crafts, books, live entertainment, children entertainment, games, culture and much more. There will also be a raffle draw and the first prize will be a return ticket to Grenada, sponsored by the Grenada Board of Tourism. Tickets for the raffle draw are already on sale and could also be purchased during the event. Your support would be greatly appreciated. Please encourage your friends and colleagues to come along as it promises to be an occasion for all the family. In excess of 2500 attended last year’s event. I wish to take this opportunity to thank you for your support; it is much appreciated. We look forward to your continued patronage. Grenadian Heritage Day – when the spirit of Grenada comes to Britain.